I certainly took my time with this one, haven't I? I got Panic around the time NARS first launched their new line of Dual-Intensity blushes (there are six of them), and promptly put it aside in (excuse the pun) panic, only allowing myself to stare at it with disbelief once a day. Seriously, look at the colors and the sheen of its finish. Was this thing going on my face? 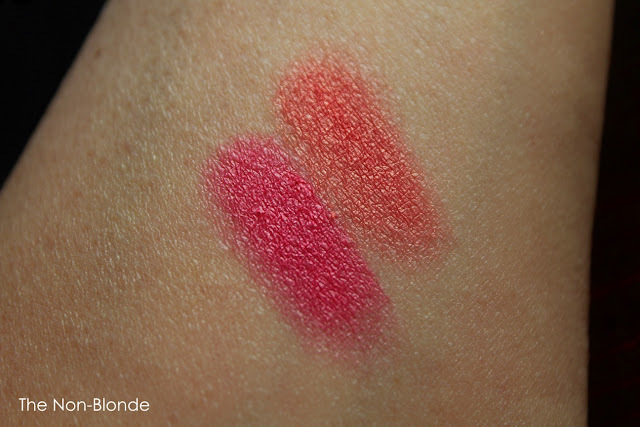 I needed some time to even take the photos and swatch this blush, but that first finger-dipping led to actually playing with Panic and learning what I can do with it and what it can do for me. 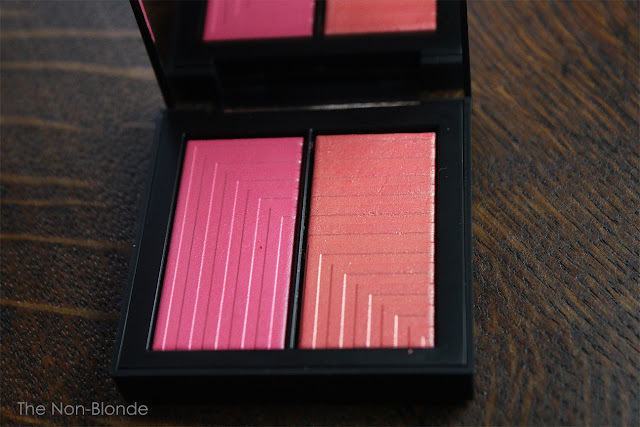 NARS Dual-Intensity blush is the sibling of their Dual-Intensity eye shadow (see my swatches here, here, and here). I love the eye shadows and use them often as the focal point of an evening makeup look. They're among the most beautiful eye shadows I have, and once you figure out various ways to use each of them, they're also quite versatile. The question is if the same thing applies to a blush of similar finish and pigment intensity. The formula of these NARS products was created to be used either dry or damp with equal effectiveness. It's not only true, but a damp brush (or a mini sponge-- try the eye shadow with the pea-size new Beauty blender) do not harm the the product that's still in the pan. It doen't change texture and never develops an icky crust. That's a brilliant feature right there. But unlike with those eye shadows where you sometimes want a foiled finish with a mega sheen, a blush might be a different story. The swatches you see above are dry. 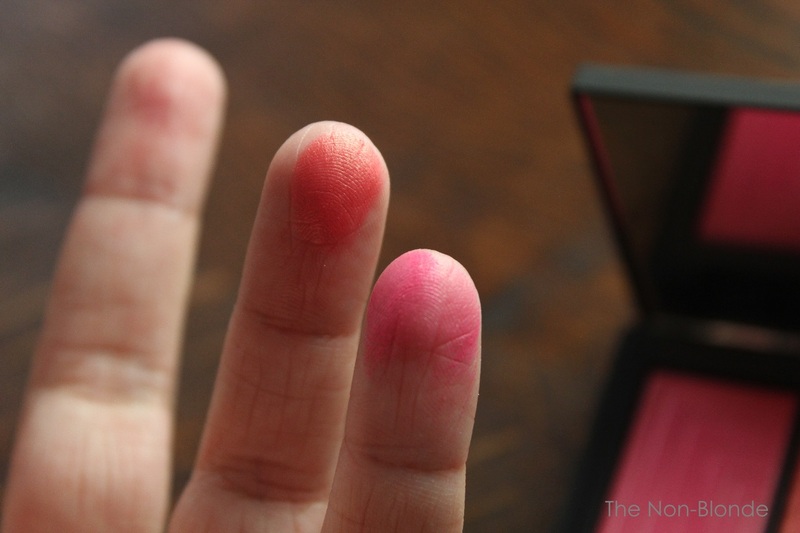 The ones on my fingers are the result of lightly touching the surface of the blush, not even swiping it. And when I did the arm swatch I got the pearly color-fest you see in the last photo. Obviously, you need to blend this stuff as though your life depends on it, and use a small fluffy brush (a small duo-fiber is also an option). Neither the bright fuchsia nor the coral are exactly natural, but they are very very beautiful, and used judiciously they can impart some radiance and life to an otherwise sallow skin. But there's no way that I'm leaving the house sporting a metallic coral cheek, so the damp option, at least for Panic is irrelevant for me. A friend of mine who truly understands makeup, texture and finish has told me that in her opinion the best technique for a "damp" use is actually to go all out and do a "wet" application. Meaning, mixing the blush with enough water to create a cream-to-liquid product, and then you can truly paint and blend it into a sheer color with an inner glow. I haven't tried it with Panic yet, but if NARS ever add a rich yet more muted color option to this range (it's truly missing a duo between Fervor and Adoration) I promise I'll do that. Another tip from my friend is that the real winners in this line are the highlighter colors. The more I think of it, the more Jubilation appears as a gorgeous versatile way to add dry or liquid sheen where you want it. Bottom Line: extremely pretty, but not for the casual user. 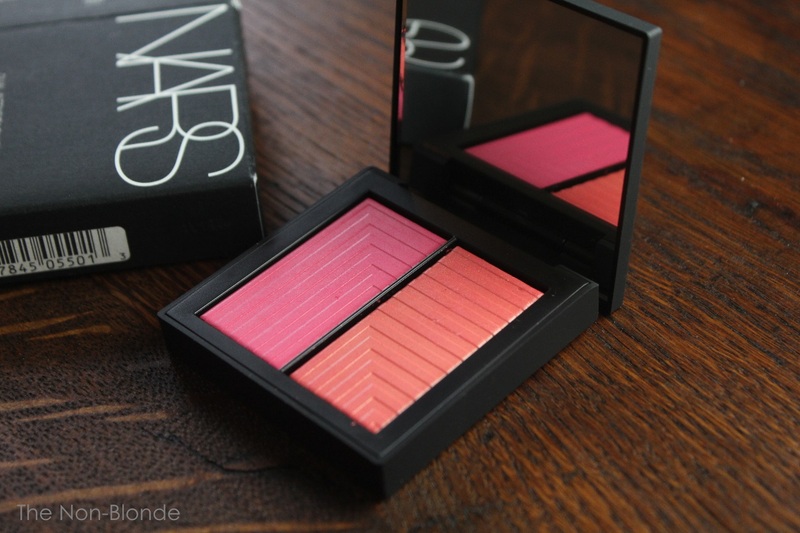 NARS Dual-Intensity Blush In Panic ($45) is available at the counters, Sephora, NARS boutiques, and narscosmetics.com. What's the point of this post? all the serious bloggers got the entire line from Nars and shown swatches of everything months ago. Here you are with a bunch of old news, one product and no new information from the company that promotes the blushes. Why should anyone take you seriously? Wow Anon - if you feel this blog isn't relevant, why bother reading it much less commenting in such a nasty manner? Perhaps I'm out of touch, these products are news to me and I'm happy to hear about them. Gaia's blog is always a fun & informative read and adds a touch of beauty to my day. If you don't like the posts then don't read the blog. No need to be nasty and $#%^ all over the place. Love this!! Panic would definitely be the shade I'd pick up from this range! Thanks for your review of this product! I always enjoy reading your blog and appreciate your color cosmetic reviews since I think we share a similar skin tone. I also learned something new from the tips your friend gave you, I must try a wet application now! Might be fun for a 70s studio 54 look? Argh, I hate google! This is the third time I'm typing my comment - that's how much I like your blog! Gorgeous - thanks for posting. This is the first review I've seen on the product - sounds like it would make a better gift than a personal purchase. Will try the wet application on my bronzer - thanks for the tip! These are gorgeous colors but wow, are they super-pigmented! I think it may be a nice look if used under foundation for a 'lit from within' look. That's what I typically do for very bright/intense colors and it works like a charm, lasts all day but much softer a look…. I should give these a try at Sephora sometime!